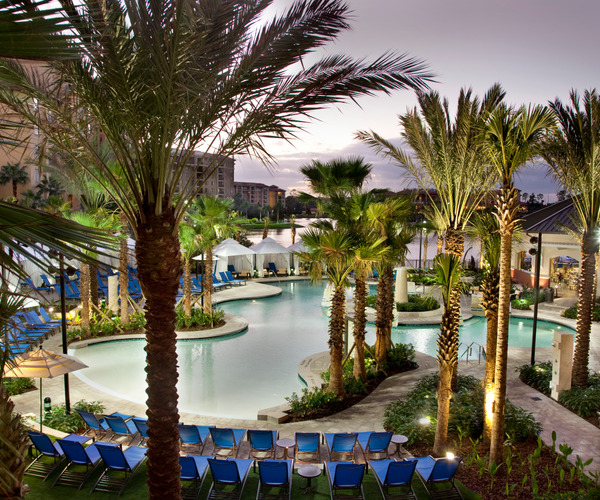 Modern in design with a Mediterranean aesthetic, the Wyndham Grand Orlando Resort Bonnet Creek provides an intimate boutique-style ambience despite being surrounded by Walt Disney World. Acres upon acres of Bonnet Creek woodland, along with the private, sparkling lake, help create a calming vibe, complemented by elegant architectural accents like the terracotta roof and handsome wood and stone touches. Whether guests desire relaxation, entertainment, family time or fitness and spa activities, they will find it at the Orlando resort. A lagoon-style pool, fitness center, kids’ club and numerous restaurants are on the grounds, and the Waldorf Astoria Golf Club is within walking distance. Moments of profound relaxation can be found in the soothing Blue Harmony Spa, which draws inspiration from water and sky, as well as in the tastefully appointed guest rooms. A sense of relaxation unfolds upon arrival at Blue Harmony Spa, where guests slip into robes and slippers and sip blueberry-infused water. 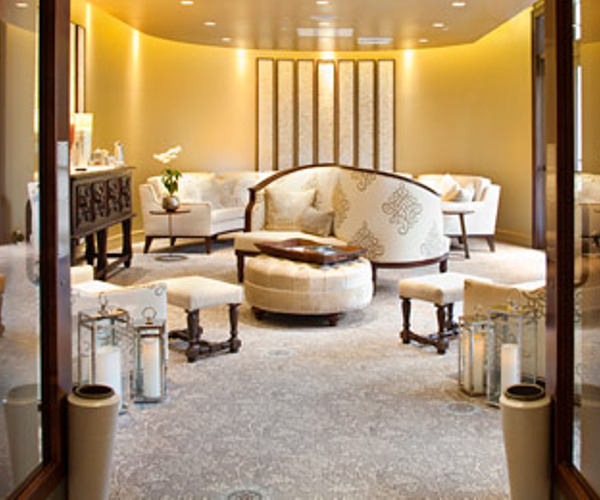 Spa services are taken indoors or alfresco in one of the open-air treatment cabanas, and a suite reserved for couples comes appointed with side-by-side soaking tubs. The signature Blue Bliss Massage, a combination of a marine oil and salt scrub and point-pressure massage, is just one of the many offerings available. Bathed in blue hues, the 5,700-square-foot spa is designed to promote a calming, therapeutic vibe, complemented by an outdoor spa garden with a private hot tub. Additional highlights include a steam room and separate men and women’s locker rooms with chromatherapy experience showers. Guests can slip into relaxation mode easily with the resort’s zero-entry lagoon-style swimming pool, conveniently located next to the spa; the Cybex-equipped fitness center is also close by. Visitors are welcome to stay on the lakefront resort’s grounds, hitting the links at the 18-hole Reese Jones course, or head off property to one of the numerous Orlando attractions – Walt Disney World is located on three sides of the Wyndham, and complimentary shuttles transfer guests to the theme park’s major hubs, including Epcot, the Magic Kingdom and Downtown Disney. Indoor and outdoor space for meetings or social functions totals more than 25,000 square feet. Modern guest room interiors feature a Mediterranean design, accented by neutral and blue color palettes. Each of the 400 rooms offer views of Bonnet Creek’s lake, the surrounding Disney parks and the on-site golf course and are designed to provide a comfortable stay. Appointments include flat-panel TVs, WiFi, iPod docking stations, coffeemakers and pillow-top mattresses with cotton BeWell Bedding. Select rooms also come with balconies. Enticing dining options include the contemporary Deep Blu Seafood Grille, available for dinner, and Tesoro Cove, a family friendly venue with a kids’ buffet and an open kitchen. The lakefront Back Bay Pool Bar & Grill serves local specialties either indoors or alfresco. The lobby’s Bar 1521 provides light fare and cocktails; guests can also head to the Barista for Starbucks coffee, drinks and gelato.